The bodies of box elder bugs are black in color and are marked by red lines along the wings, thorax and sides. Nymphs have bright red abdomens. Box elder bugs feed on soft plant tissues, such as leaves and flowers. The rust red eggs of the box elder bug are laid on and destroy host trees. Box elder bugs inhabit maples and ashes, and seed-bearing box elder trees, in warm seasons. In winter, they can be found in interior areas such as houses and warm buildings. Adult centipedes are brown and measure over one inch in length. The name centipede, which means "100 legs," can be somewhat misleading: centipedes may have anywhere from 15 to 191 pairs of legs. Because most centipedes are carnivorous creatures that forage for food at night, they use their claws to paralyze their victims, such as worms, spiders and small vertebrates. Although centipedes may help homeowners get rid of insects like cockroaches and houseflies, large species could produce bites that are as painful as bee stings. Centipedes may enter houses and buildings, but they tend to not roam during daytime. They hide in damp areas around bathrooms, closets, basements and other sites typically infested by pests. Crickets are generally black or brown with long back legs and antennae. They reproduce quickly and make loud, high-pitched sounds at night. These sounds are produced when male crickets rub their forewings together in order to attract females. They typically live and breed outdoors and invade buildings searching for food, moisture, or shelter. The adults are attracted to bright lights on buildings and may fly into homes and other buildings because of this. House crickets can damage silk, woolens, paper, fruits and vegetables. Crickets dwell beneath rocks and logs and are nocturnal in nature. They are omnivorous scavengers and renew soil minerals by breaking down plant materials. However, they are a destructive presence in agricultural communities, as they feed on crops and seedlings. Earwigs are dark brown and about 1 inch long. They are slender insects with two pair of wings. Some species produce a foul smelling liquid that they use for defense. Earwigs are omnivores that will catch and eat other insects. There is a superstition that earwigs burrow into the ears of people while they sleep, but there have never been any confirmed cases of this really happening. Earwigs are active at night. During the day they hide in cracks in damp areas. They live under rocks and logs and in mulch in flowerbeds. Adult fleas are approximately 1/8-inch long and are dark in color, ranging from brown to reddish-brown. The bodies of fleas are thin and flat, allowing for easy movement through an animal's fur. They are also covered in hair that serves to root them to the host. Fleas are hematophagus, meaning they live by ingesting the blood. They are wingless, although they are capable of jumping large distances from host to host as a result of their six long legs. Adults have mouthparts which are used to pierce the skin and extract the host's blood. Pets suffering from flea bites scratch themselves incessantly. Fleas also feed on humans and some people may exhibit flea allergies. Fleas can pose severe health risks due to the fact that, aside from the discomfort of bites, they may also carry human diseases such as typhus and tularemia. 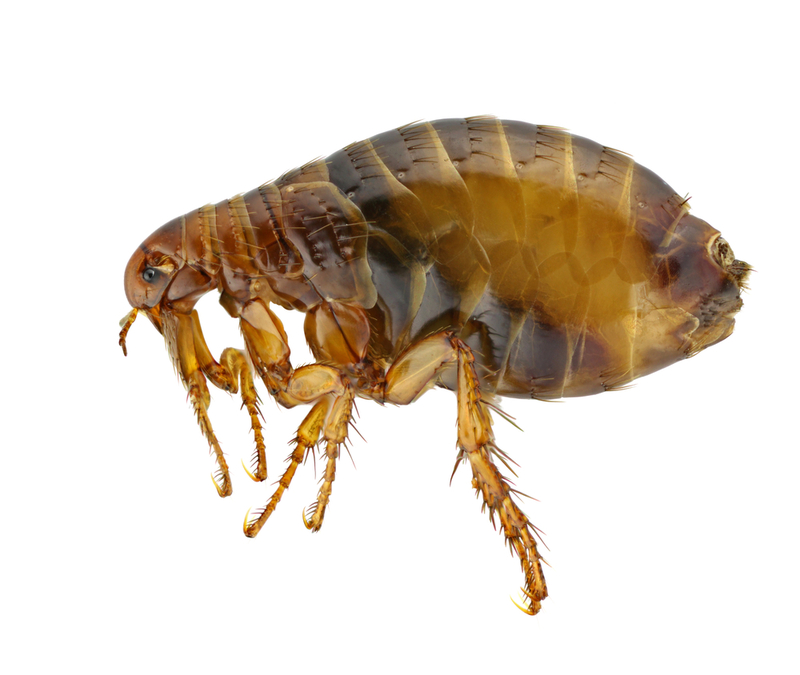 Most types of fleas regularly spend time away from their hosts and are then commonly found on the floors of homes, heavily trafficked foot paths, animal pens, and pet beds. Flea larvae are free-living and do not make their home on the body of a bird or mammal until adulthood. They are usually found in pet beds and bird nests already infested with adult fleas. If your pet has fleas, you may find them on your skin or clothes after petting or playing with your dog or cat. Common species are brown or black, sometimes mottled with red or orange. They are roughly one to 1 - 1/2 inches long and are segmented, with 2 pairs of legs per segment. Unlike centipedes, millipedes are not poisonous. They tend to curl up and remain motionless when threatened or touched. They eat damp and decaying wood and plant matter, where they often live. They will also eat decomposing earthworms, insects, and snails. Conditions that are either too wet or too dry will force millipede "migrations" to the surface of the soil and to higher ground. 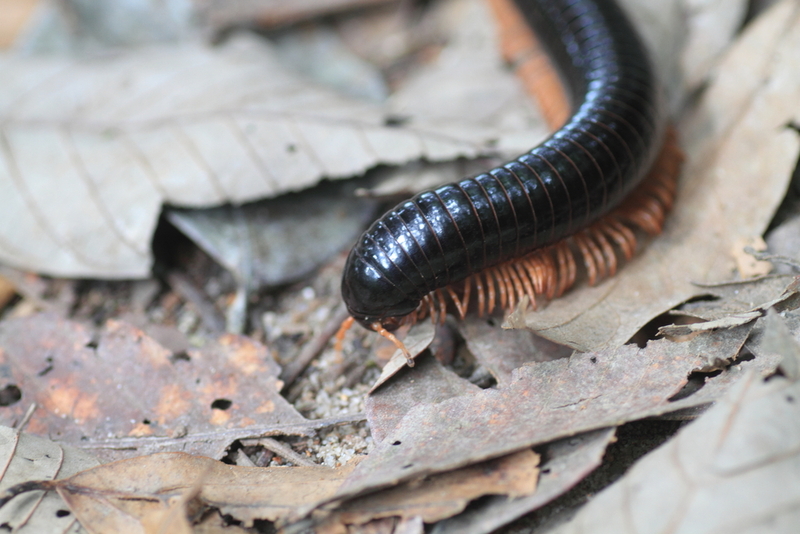 Millipedes are nocturnal and normally live outdoors in moist vegetation, leaf litter, and mulch. Occasionally, a few will crawl into homes. They can, however, survive indoors in moist basements and crawl spaces. White to brown-grey or bluish-silver in color, silverfish are teardrop-shaped insects that measure up to one inch in length. They have long antennae and are sometimes said to look like little brown or grey carrots. Silverfish feed on carbohydrates, particularly sugars and starches. Cellulose, shampoos, glue in books, linen, silk and dead insects may be food sources. Silverfish prefer to dwell in dark, damp areas such as basements, attics, kitchens and bathrooms, but can thrive in most climates. They are also known to eat the glue from behind wallpaper and find their way into unopened food packages. Despite their name, sowbugs are not really bugs. They are land-living crustaceans. Sowbugs are flat, oval creatures. They are about 1/2 inch long. Their body has several segments. The pillbug, resembles the sowbug, but sowbugs cannot roll up when they are disturbed like pillbugs do. Sowbugs eat organic debris and decaying plants, so it is common to find them under mulch in flowerbeds. To conserve moisture, they are usually active at night. They are not able to retain water in their bodies, so they spend most of their time in damp places. Outdoors they hide under logs, rocks, flowerpots, and trashcans. Color ranges from grey to black and most are 1/16 inch in length. They get their name from a spring-like structure, called the furcula located on the back of their abdomen. It is normally curled under the body, but when the insect is disturbed, it unfolds the furcula instantly. This causes the insect to jump. One jump can cover three or four inches. Springtails normally live in damp soil. They eat mold and fungus. They are common in flowerbeds, under logs, paving stones, and landscape timbers and woodpiles. They enter homes under door thresholds. When they get inside, they go to humid areas. It is normal to find springtails in basements, kitchens, and bathrooms. Springtails have been found inside walls where a pipe has been leaking. They have also been found in furniture that has become wet and mildewed. Potted plants and planter boxes are also places where springtails live.